It’s not an outlandish claim to say that Dawn of War III is very, very different to the games that came before it. 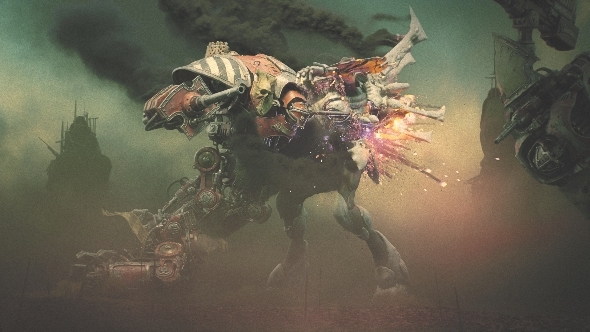 Relic’s tenure with the Warhammer 40,000 license has been akin to a great band experimenting and evolving with every new album. Everyone loved their debut, but the follow-up was somewhat divisive. Now it’s time for the confident third record, and Relic have returned to their original base-building blueprints. They’ve created a game that feels more traditional of the RTS genre, for better and worse. Learn the art of war with these brilliant PC strategy games. My hands-on time with Dawn of War III is a bit of a tragic tale. Gamescom, despite its name, is actually the worst place to play a game. Being alone in a bright white room where a PC awaits its next player isn’t the most immersive feeling. No tutorials or presentations prefaced this hands-on. And while I love Warhammer and have enjoyed the previous Dawn of War games, I’m not the best RTS player. So armed with the basic knowledge that Dawn of War III shares more blood with its oldest sibling than the middle child, I sat down and took command of the Blood Ravens. 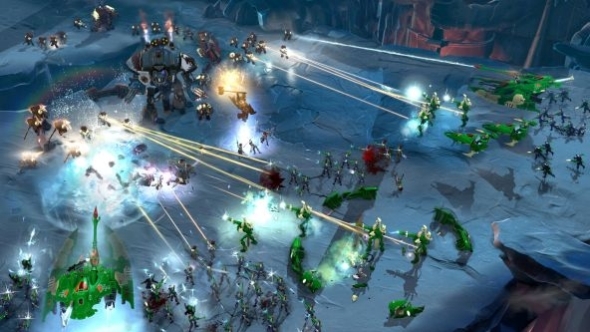 After just a few minutes of play, the biggest difference in Dawn of War III is clear: it feels far more like a traditional RTS than ever before. Rather than Relic’s previous Warhammer games, I’m reminded of StarCraft II more than anything. The camera doesn’t zoom in close enough to study the skull decals on the side of a bolt gun, it instead hovers at a mid-level height that’s been of service to so many strategy games. This is almost certainly due to the number of units in battle, which is a leap ahead of what you could field in the first game. It’s never quite of Zerg quantities, but when going up against an Eldar force there seemed to be far more lazers whizzing across the screen than I remember in previous outings. While squad sizes remain intact, there’s just more of everything else. As such, the prevailing feeling is that of everything being expendable. Space Marines become replaceable ants, rather than formidable veterans encased in plasteel and adamantium. This comes across in their combat effectiveness, too. 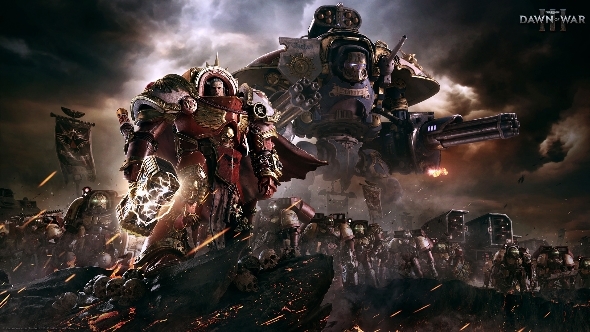 I’ll admit my fondness for the series lies in the squad-based tactics of Dawn of War II where each of your very few units can shrug off incoming fire like rain, but even compared to what I recall of the first game, Dawn of War III’s Space Marines seem to drop like flies. They don’t feel like the hardy, best-of-the-best soldiers that the lore proclaims them to be. As my army was being minced to pieces by the Eldar, I realised that something has been lost in this rendition of the 40k universe. Games Workshop’s space elves are never given quite enough credit as they deserve, and Dawn of War III is looking to make sure everyone knows the Craftworld can spit out warriors that can best the Imperium’s finest. This time around Eldar have something called Battle Focus, which grants them a regenerative shield that must be broken through before they take damage. They do go down pretty quickly once the shields are destroyed, but until then their ability to shrug off shots and dash around the battlefield with significant speed makes them a notable adversary. Indeed, they’re probably going to be a far more interesting race to play as than the deeply traditional Space Marines, and perhaps even the fleshy battering ram that is the Ork race. 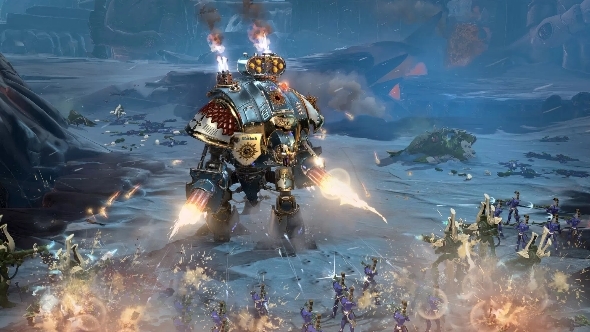 Dawn of War III’s most flashy addition to the formula is the huge special hero unit. While the hammer-swinging Gabriel Angelos will always have a place in our hearts, the forty-foot-tall Imperial Knight Lady Solaria is our new fixation. A mech with gatling guns for arms and shoulders made of missile pods, she’s absolutely a force to be reckoned with. At least, she probably is if you’re any good at the game. As I mentioned before, I went into the gameplay session with no introductions to the game at all. There was no in-game tutorial or even any pop-up tips to help out, and it’s been a decade since I played the first Dawn of War game. In other words, I was practically begging to be slaughtered. I expected to lose some Space Marines in the mess, but I didn’t expect to see Lady Solaria fall apart in a giant nuclear explosion. See, while she’s a colossal super unit, she’s not invincible. All her weapons have a long-distance minimum range, meaning if anything charges at her legs she’s got no way of defending herself. And when you get into a resource crisis like I did, you’ll quickly find that if you can’t replace the squads of marines protecting her, she’ll go down eventually. She can respawn, but you’ve got to wait five minutes for her to be re-assembled. So Imperial Knights are definitely not the no-brainer solution to every problem, and this is likely true of the other races’ super units, too. They’ll only become truly super when backed up by the correct tactics. I’m positive that people with only a smidgen more RTS knowledge than me can manage that (they’d need to, say, realise that Listening Posts are a thing again, and you need to build them to gather resources), so getting the most out of super units looks like it won’t be too tricky, provided you realise they’re not a crutch for your whole army. Despite my woeful performance on the battlefield at Gamescom, I think there’s reason to be positive about Dawn of War III. It feels capable and well-built, with interesting units and a brilliant universe to further explore. But my excitement for a new Dawn of War is damped by how conservative it all feels. Where the first two games were distinct beasts that stood out from the RTS crowd, this third outing feels far more akin to the many strategy games you’ve played before. And while being like other good titles is in itself nothing to be concerned about, I worry that Dawn of War is on a path to lose some of its unique identity. I can’t understate what a great loss that would be.